‍I love reading books and taking notes on books. But my biggest problem is storing the books. I move a lot. I travel a lot. And I can’t store all the books I have read. I always try to keep all of them until next moving. But the end comes and I always need to leave them back. But right now, with book scanner I can always store my pages without keeping the books physically. Today I’m going to introduce you with my new explore at Amazon. I’m introducing a revolutionary smart book scanner, CZUR, which got excellent results on Indiegogo (Won around 850k dollars in just 2 months). CZUR is a perfect tool for scanning many pages of books and art diagrams. It is the highest cost-performance book scanner in the world. Traditional book scanners on the market are very complicated to use with high cost, bulky size and slow scanning speed, which has been an industry-wide issue all along. CZUR has solved this problem through original innovation technology with developing brand-new ET 16 Plus book scanner that features simple operation, compact size and quickly scanning at the speed of 1.5s/dual-page. CZUR scanner helps you to build your private digital library with an easier and faster way. Equipped with 16 million pixels and creative algorithms, CZUR can make scanning books as easy as turning pages. The most difficult problems of including the flattening curve, erasing fingerprints, and smart edge-cutting have been solved. Through powerful image processing and computing abilities, it increases the scanning speed about 20 times faster when compared to the traditional scanner. Using CZUR, you can scan everything in the office, including files, contracts, vouchers, etc. CZUR ET16 Plus changes your scanning experience by bringing simple, intelligent and fast scanning performance. All books, magazines, contracts and any paper documents within size A3 can be scanned directly without cutting or damage. The CZUR ET16 Plus is also capable of scanning physical objects such as sculptures. All of your scanned documents can be converted to editable Word/PDF or TIFF. ET16 Plus have also additional side lights. The side lights will help to reduce the glare when scanning glossy materials. How To Operate CZUR ET 16 Plus? With associated software CZUR Scanner, it supports basic image processing functions（rotate, crop, and etc.) and batch operations etc. There are multiple operating modes including: hand button，foot pedal，scanner button, software button etc. 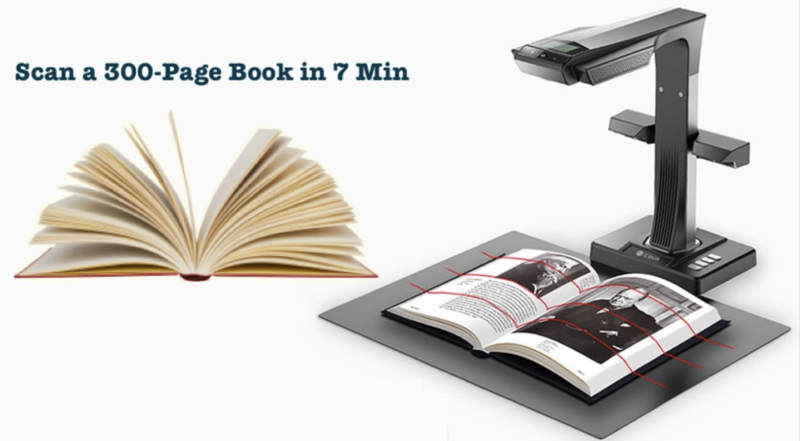 CZUR Smart Book Scanner is a high speed book scanner to scan bound books, and photos, manuscripts, test papers, contracts as well. It can be used for home, university/school, library, administration office and also a good help for freelancers and parents. Where To Buy CZUR ET16 Plus Book Scanner? More information is available at http://www.czur.com and facebook page: https://www.facebook.com/czur . 1.Q: What formats can be saved on the PC by CZUR scanner software? 2.Q: What is the size per one-page scanned and saved in PDF format? A: The processed original image is 2M. The compression ratio can be preselected; if the compression ratio is 80%, the single processed image will be 500K. 3.Q: If using fingers to press the books when scanning, will the fingerprint be left in the scanned image? A: CZUR scanner software will automatically identify and remove the fingerprint in the background. 4.Q: Does CZUR scanner software support OCR function to output editable documents? A: Yes, CZUR scanner software supports OCR function using Abbyy technology. 5.Q: Can the slant be corrected by software? Can the shadow in the binding gap be erased? A: Yes, CZUR scanner software will erase the shadow in the binding gap and correct the slant.